Support. A roundabout is a specific type of circular intersection designed to control speeds and having specific traffic control features. Guidance. 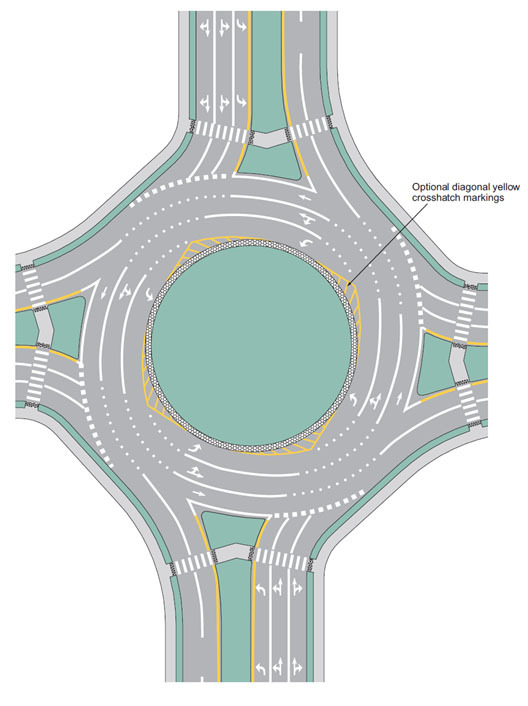 Pavement markings and signing for a roundabout should be integrally designed to correspond to the geometric design and intended lane use of a roundabout. 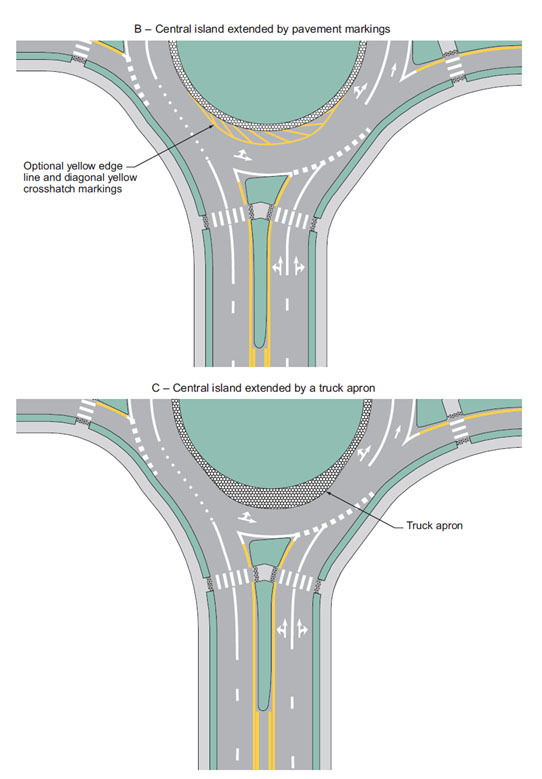 Markings on the approaches to a roundabout and on the circular roadway should be compatible with each other to provide a consistent message to road users and should facilitate movement through the roundabout so that vehicles do not have to change lanes within the circulatory roadway in order to exit the roundabout in a given direction. Support. Fig. 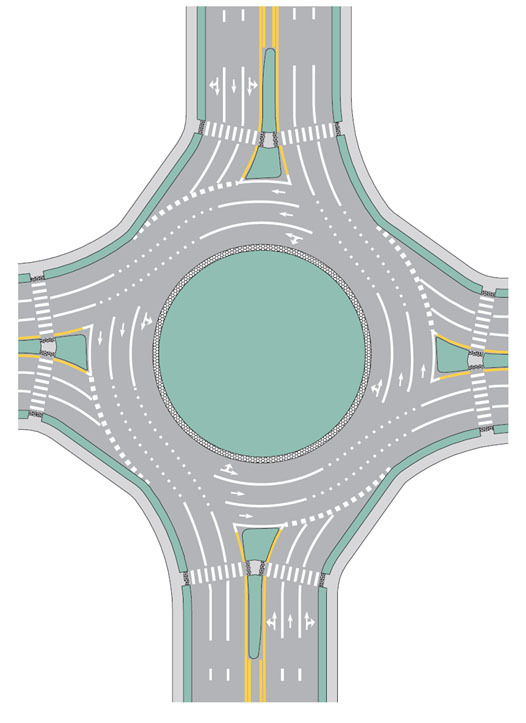 620.3.1.1, Examples of markings for Approach and Circulatory Roadways at a Roundabout, provides an example of the pavement markings for approach and circulatory roadways at a roundabout. Fig. 620.3.1.2 Lane-Use Arrow Pavement Marking for Roundabout Approaches shows the options that are available for lane-use pavement marking arrows on approaches to roundabouts. Figs. 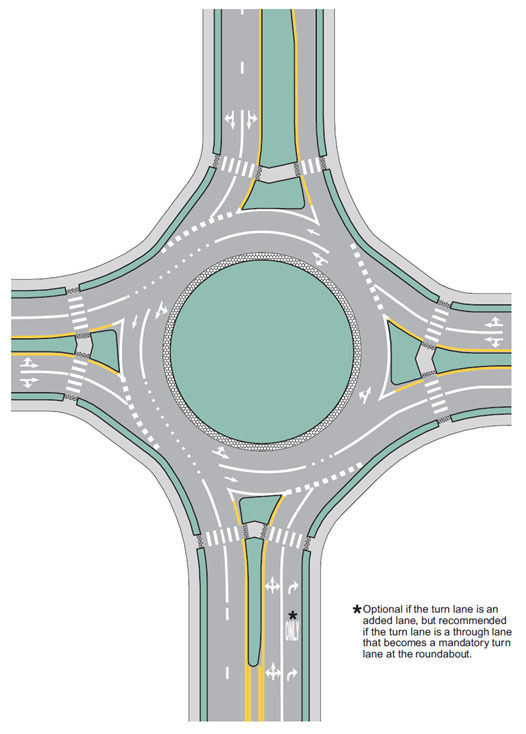 620.3.1.3 through 620.3.1.15 illustrate examples of markings for roundabouts of various geometric and lane-use configurations. Traffic control signals or pedestrian hybrid beacons (see MUTCD Part 4) are sometimes used at roundabouts to facilitate the crossing of pedestrians or to meter traffic. 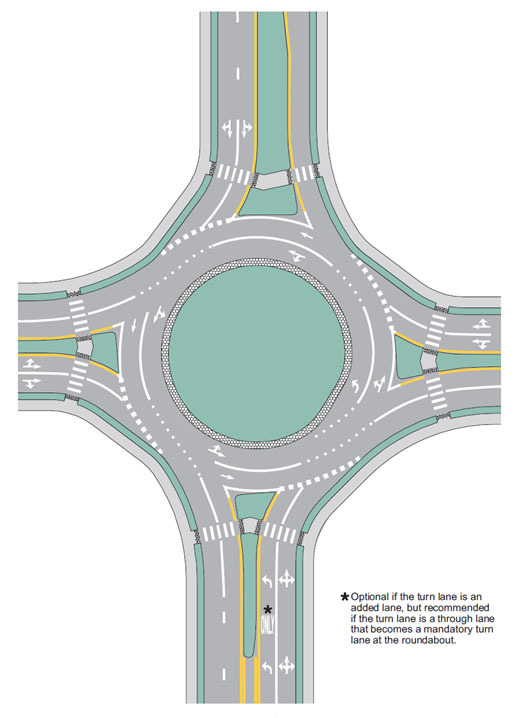 MUTCD Section 8C.12 contains information about roundabouts that contain or are in close proximity to grade crossings. Standard. 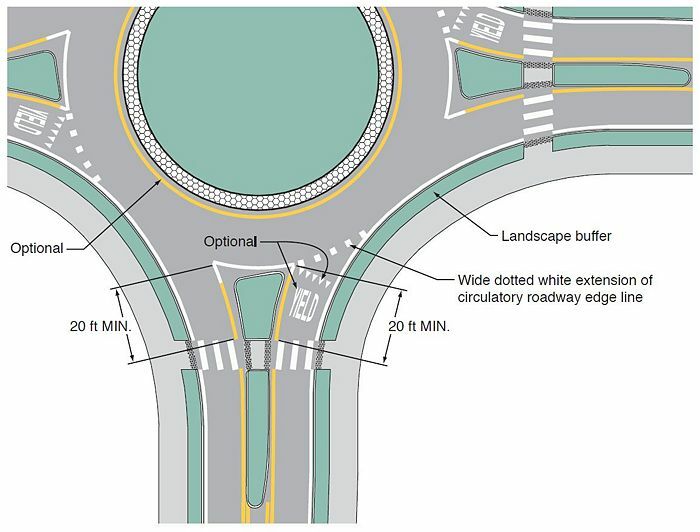 Multi-lane approaches to roundabouts shall have lane lines. A through lane on a roadway that becomes a dropped lane (mandatory turn lane) at a roundabout shall be marked with a dotted white lane line in accordance with EPG 620.2.4 White Lane Line Pavement Markings and Warrants. Guidance. 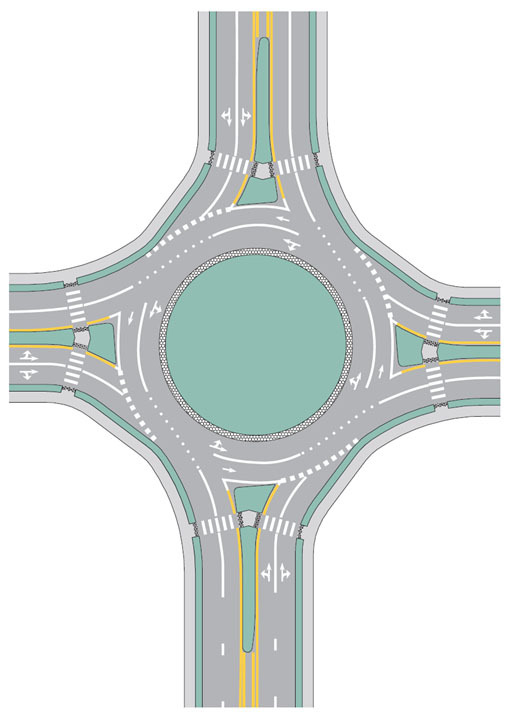 Multi-lane roundabouts should have lane line markings within the circulatory roadway to channelize traffic to the appropriate exit lane. Standard. 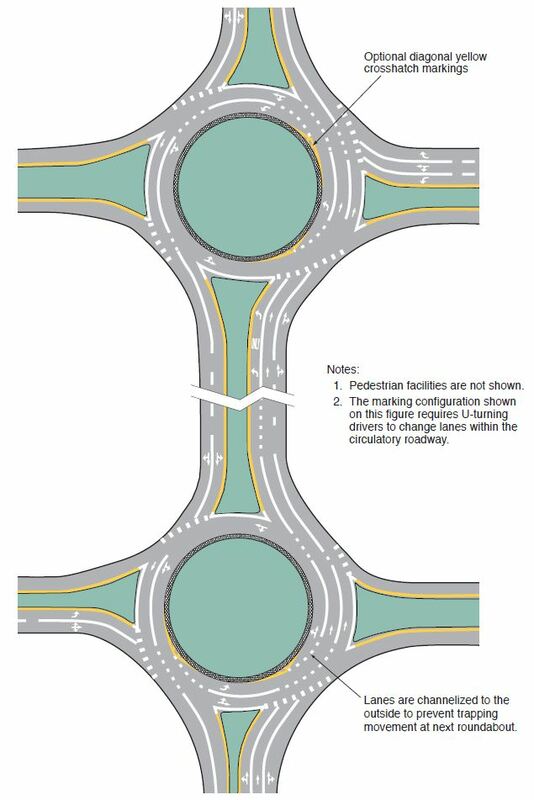 Continuous concentric lane lines shall not be used within the circulatory roadway of roundabouts. Support. MUTCD Section 9C.04 contains information regarding bicycle lane markings at roundabouts. Guidance. A white edgeline should be used on the outer (right-hand) side of the circulatory roadway. B. A wide dotted line across the lane(s) entering the roundabout. 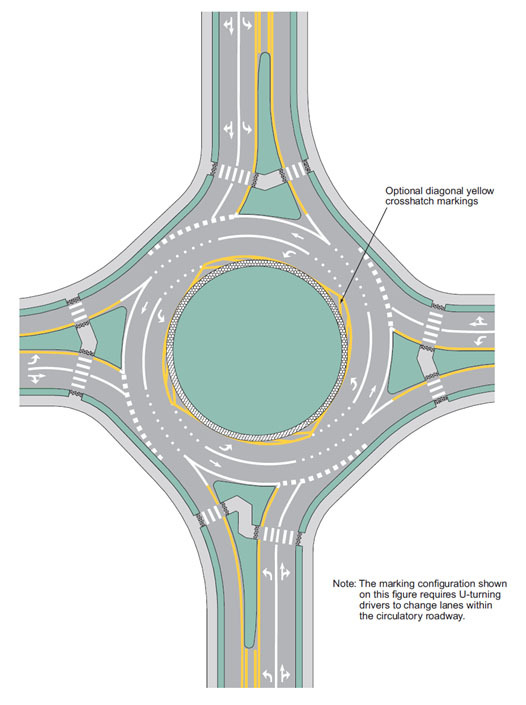 Standard: Edgelines and edgeline extensions shall not be placed across the exits from the circulatory roadway at roundabouts. Option. A yellow edgeline may be placed around the inner (left-hand) edge of the circulatory roadway (see Fig. 620.3.1.1) and may be used to channelize traffic (see Fig. 620.3.1.5). Option. A yield line (see EPG 620.2.16 Stop and Yield Lines) may be used to indicate the point behind which vehicles are required to yield at the entrance to a roundabout (see Fig. 620.3.1.1). Standard. 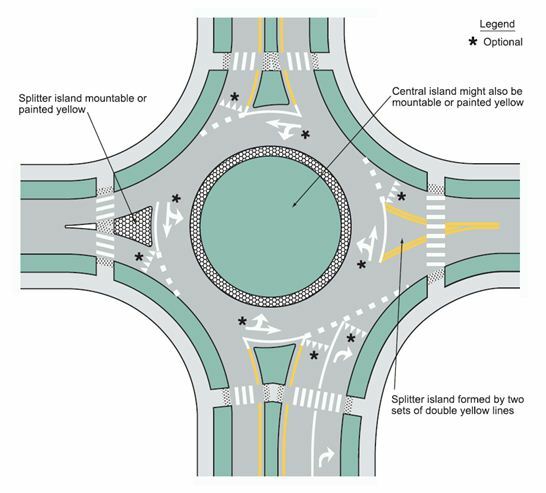 Pedestrian crosswalks shall not be marked to or from the central island of roundabouts. Guidance. If pedestrian facilities are provided, crosswalks (see EPG 620.2.18 Crosswalk Markings) should be marked across roundabout entrances and exits to indicate where pedestrians are intended to cross. Crosswalks should be a minimum of 20 ft. from the edge of the circulatory roadway. Support. 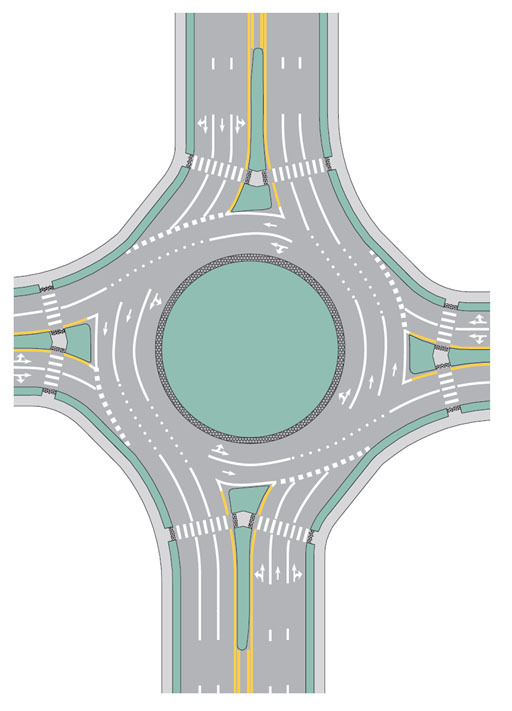 Various arrangements of crosswalks at roundabouts are illustrated in the figures in this article. Option. Lane-use arrows may be used on any approach to and within the circulatory roadway of any roundabout. YIELD (word) and YIELD AHEAD (symbol or word) pavement markings (see Fig. 620.3.1.1) may be used on approaches to roundabouts. Word and/or route shield pavement markings may be used on an approach to or within the circulatory roadway of a roundabout to provide route and/or destination guidance information to road users (see Fig. 620.3.1.15). Guidance. Within the circulatory roadway of multi-lane roundabouts, normal lane-use arrows (see EPG 620.2.20 Pavement Word, Symbol and Arrow Markings and Figure 620.2.20.7) should be used. 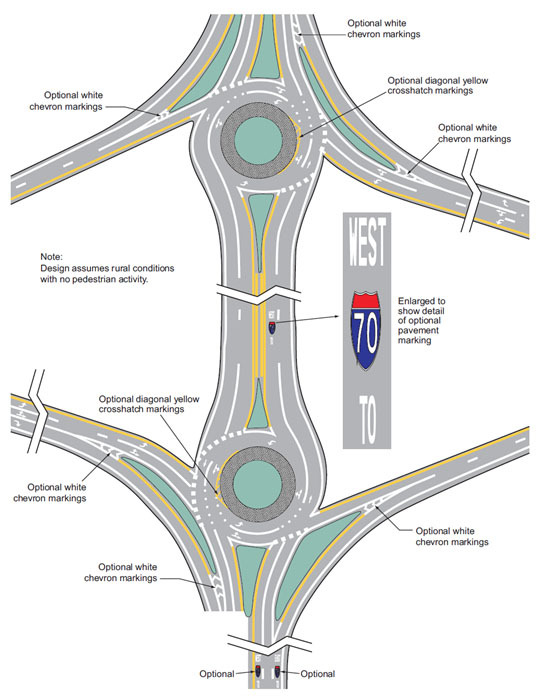 On multi-lane approaches with double left-turn and/or double right-turn lanes, lane-use arrows as shown in Figures 620.3.1.8 and 620.3.1.9 should be used. Option. 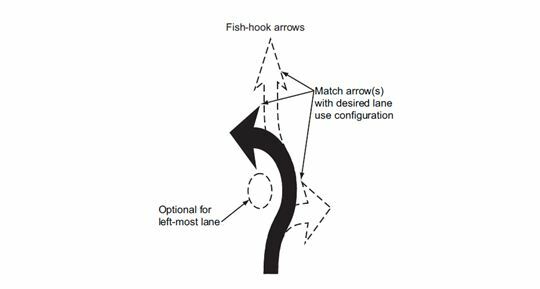 If used on approaches to a roundabout, fishhook arrows may be used to help provide additional guidance with an oval symbolizing the central island for the innermost travel lane and without an oval for all other lanes approaching a roundabout. Examples of pavement marking arrows are shown in Fig. 620.3.1.2. The MUTCD allows the use of normal arrows for approaches to roundabouts as depicted in the figures in the EPG, however, the appropriate fishhook arrows should be used in these locations in Missouri. Standard. The fishhook series of arrows as shown in Fig. 620.3.1.2 shall be used. Support. 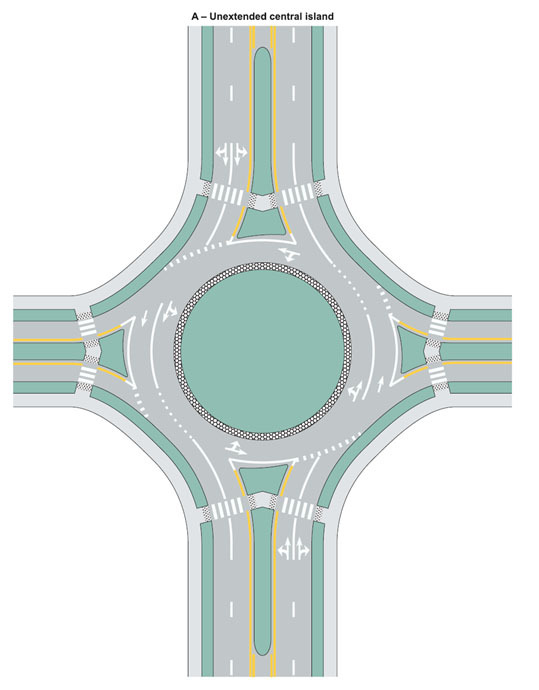 Other circular intersections include, but are not limited to, rotaries, traffic circles and residential traffic calming designs. Option. 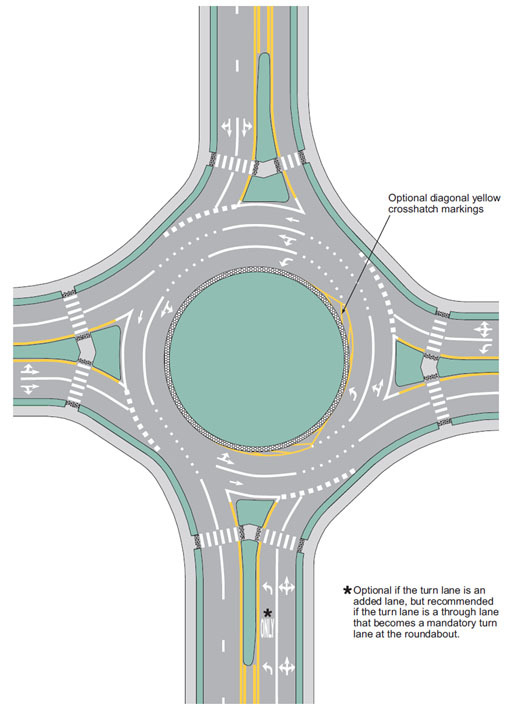 The markings shown in this article may be used at other circular intersections if engineering judgment indicates that their presence will benefit drivers, pedestrians or other road users. This page was last modified on 7 April 2017, at 15:21.